This little truck is a warrior. Spork has taken it on a ton of trails as is, and it does really really well. His family outgrew it, and I picked it up for a great price. Thanks Spork! I chose the name "Abner" which means "army commander" in Hebrew. The name fits the truck. Anyway, here she is. 1997 reg cab base model (it doesn't even have a clock or a tach). 2.7L 5 speed. 170k on the clock, and I'm sure it'll do another 170k more. It's all stock except for 31's and sliders. This is a non-trd model, so it does not have a locker. Plans: I'm sure I want to keep it IFS. One day I want 35's and an OME lift, and the next day I want to keep it stock and throw in an aussie locker. Who knows where it'll end up. I really enjoy driving it around, it's a fun little car. First order of business is usually to install sliders. Since I've already got those, it's on to the second order of business: CB install. I've used small fuse blocks from AutoZone in the past, but I wanted to try something new for this build. I picked this 12-fuse box up from Low Range Offroad. It really only fit well in one place: on top of the stock fuse box. It was close to the battery, and out of the way of everything. Looks and sounds like it'll be fun. Looking forward to the build and changes you will make. And the hundreds of pages to read. Good luck Steve! I mounted it to the top of the old fuse box. The uniden Pro 520xl is the perfect width for a toyota ash tray. Remove the ash tray and velcro it to the top of the hole where the ash tray was. I had to trim the back of the cutout with a dremel to allow the cb to fit in there. On a tacoma, the 520xl is a little too long to fit perfectly flush, but it's close enough. I had to put an L-adapter on the CB antenna cable to make it fit. Very nice, I'll have to pick one of those up for my buggy.. I never thought of putting radar or a fish finder on it for some reason. It will be cool to see what you do with it Steve. Thanks Scott. I know it's tough to watch someone else modify your old rig. Sorry! It's all good, I picked up a trooper and I've been busy making it mine. Changed all the fluids on it today and I found some nasty diff fluid in the rear so hopefully it's fine and won't cause me issues down the road. The trooper strangely reminds me of a Samurai I used to own, maybe it's the boxy shape or some of the Japanese engineering but it's been refreshing to get my hands on something else. Glad to hear it. Now you need to start a thread about your new rig. Congrats on the new project! I have a NIB Spartan 4cyl locker that would love to be installed in that. Everyone seems to be picking up Troopers these days. What do you think about putting some silicone on/in the mounting bolt holes for your new fuse block to keep water out of the stock fuse box? 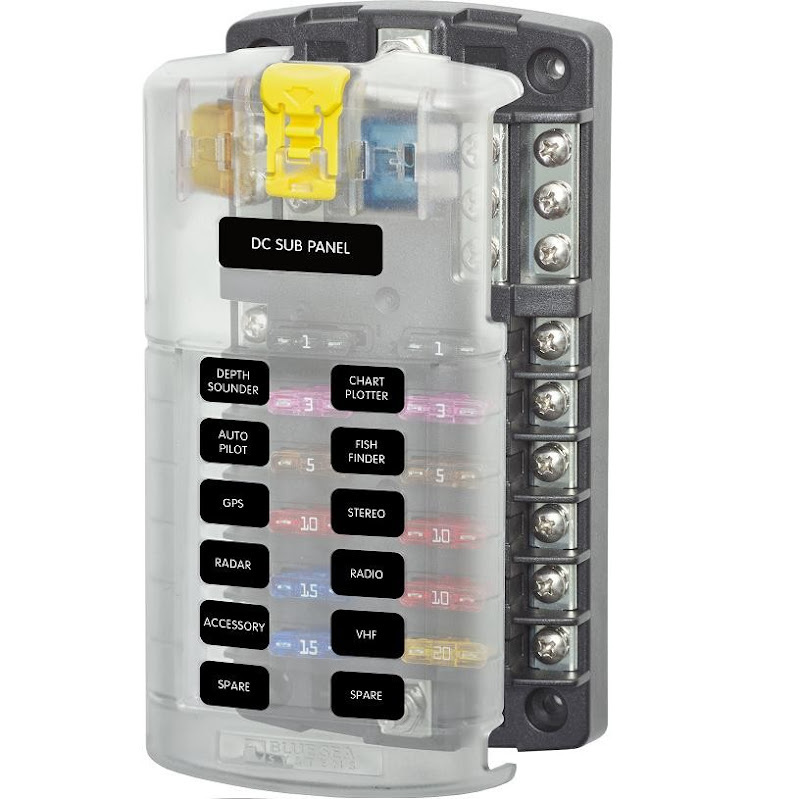 That's a good looking fuse box, Steve, what'd it run you? is it for an 8.4" diff, or the regular 8" diff? That's an excellent idea, thanks for mentioning it. Even though I don't expect there to be much water under the hood, I'm going to do that as a precaution. I only wish the aftermarket box were water-tight, but there's nothing important in there, so it'll be ok. Thanks. Since prices change, I'm going to post up the link to Low Range's site, where they'll keep their prices updated. 6 circuit should be plenty for any human, but I figured it was worth the $10 for the 12 circuit model. I suffer from "might as well" disease like so many others on here. It is for the regular SA 4cyl 8". I'd be happy to get a pn if you are interested.